The fraudster and con-man known as Yusuf Achmat (Malafa Fishing CC) has been removed as a beneficiary of an interim relief lobster quota, making way for a deserving and honest fisherman who actually relies on fishing for a living. 1. Mr Achmat is known to have defrauded a number of commercial fishing companies by posing as the holder/owner/authorised representative of commercial fishing rights in the lobster offshore and small pelagic fisheries. Feike provided copies of bank statements showing Achmat’s receipt of funds totaling more than R200 000 and his fraudulent signature on a number of agreements. 2. Mr Achmat poses as the owner of Malafa Fishing Fishing CC (a defunct entity of which he is not a member) and fraudulently advertises that he/Malafa owns an offshore lobster commercial fishing right amounting to 15 tons. The department advises that it had attempted to obtain Achmat’s response to the allegations put forward by Feike but refused to answer his mobile phone and refused to respond to written requests to attend a meeting of the verification team. The Department has also advised that all fishery control officers have been informed that Achmat is not permitted to lawfully harvest any fish. The South African government’s Service Delivery Review publication, which aims to publicise examples of service delivery by state departments, provides an in-depth analysis of the success of broad based black economic empowerment in the South African commercial fisheries with particular reference to the hake deep sea trawl fishery. 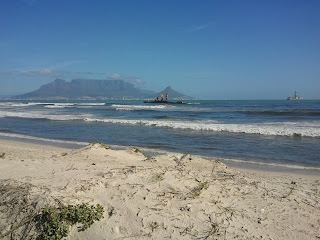 The Seli 1 leaked more oil on 3 September 2011 which washed up onto Blouberg Beach today. The smell of oil was still very pungent by 14h00 but had largely dissipated by 17h00. The City of Cape Town had cordoned off access to the beach and had largely cleaned up the beach of significant oil deposits by 17h00. Although not a substantial spill, some sea life has been affected with the City reporting the death of 4 gulls and seals. The beach has been closed to all recreational activity. The Seli 1 is a Turkish bulk carrier, operated by TEB Maritime of Istanbul, and was en route to Gibraltar when it was driven aground off Blouberg beach by strong westerly winds shortly after midnight on 18 September 2009, having reported engine failure and a snapped anchor chain. The ship was carrying a cargo of 30 000 tons of coal, and 660 tonnes of heavy fuel oil with 60 tons of diesel fuel. The vessel was essentially abandoned by its insurers, the Russian P&I Pool and its owner.